Fibromyalgia syndrome is a distressing disorder with a range of symptoms including pain and fatigue. Studies to develop new treatments for fibromyalgia syndrome can be difficult because of the placebo effect – but what actually is the placebo effect? A placebo is a dummy pill or treatment that looks or feels like the real thing – for example, it could be a pill just made of sugar or starch, an injection that is just saline or water, or acupuncture needles that look real but do not go into the skin. Even though a placebo contains no active treatment, some people do still respond to it – this is known as the placebo effect. This may be a perceived effect (it just makes them feel better) or an actual effect (they actually do get better, at least to an extent). Some diseases respond better than average to placebos, such as pain, including fibromyalgia syndrome, headache and arthritis, ulcers and depression. When scientists conduct clinical trials to check how well a new drug is working, they often give one group of patients the real drug and another group the dummy drug, so that they can compare the symptoms – if the new drugs work, the patients on the new drug should get better, and the patients on the placebo should stay the same, get a little better, or get worse. If a lot of the placebo patients show major improvements, this can make it difficult for the scientists conducting clinical trials to tell whether the actual drug is having any effect. While the placebo effect is a response to a dummy pill or treatment, placebos do cause changes in the brain, so they do actually have an effect, showing that there is a strong connection between the body and brain, especially in illness. The opposite of the placebo effect is the ‘nocebo effect’, where things don’t work or cause side effects because people believe that they will. 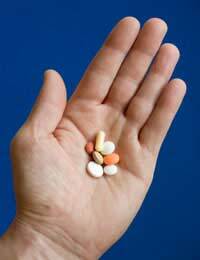 Some people with fibromyalgia syndrome seem to respond well to placebos. According to some research carried out in the USA, this is more likely in people with fibromyalgia syndrome whose pain fluctuates widely. This may be a large enough effect to cause problems with clinical trials for drugs for fibromyalgia syndrome. The results from clinical trials may be clearer if doctors can exclude patients with widely-fluctuating pain from the clinical trials. Though it may seem unfair, this may mean that drugs for fibromyalgia syndrome could be developed and studied more quickly. What Does This Mean For People With Fibromyalgia Syndrome? The placebo effect in fibromyalgia syndrome may also explain why some patients respond to some drug treatments and others do not. The placebo effect may also explain why some people respond to some unproved alternative treatments for fibromyalgia syndrome, such as homeopathy – because the patients believe that it works, for some of them it actually does work. The placebo effect may also be stronger for alternative therapies because some people have closer relationships with alternative therapists than with doctors.